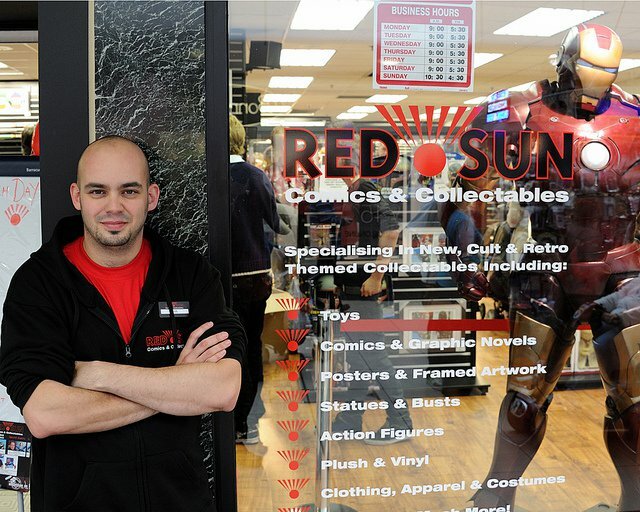 Paul aka 'Krypt' (X-box live nickname) or Kryptonian Warrior, 32 years old, owner and manager of Red Sun comics & Collectables in Chelmsford Essex. 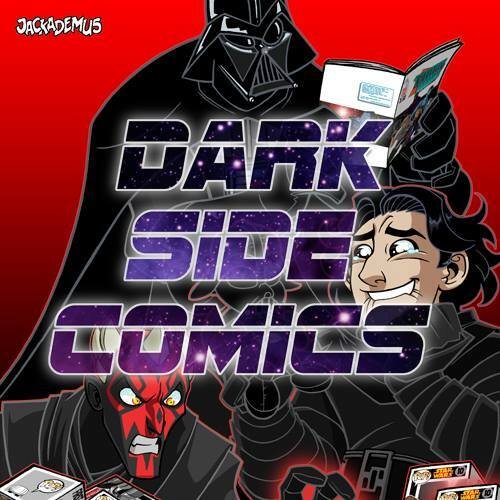 Fanboy since I was born in 1978 and obsessed with Superman, Star Wars and everything else geeky... Literally! Me in Stargate SG-1 gear for a convention a few years back! I definitely consider myself a geek-guru and have an almost photographic memory for all fanboy-ish stuff. Hence me finally opening a comic and collectable store. I've never met someone with my knowledge before and probably never will! 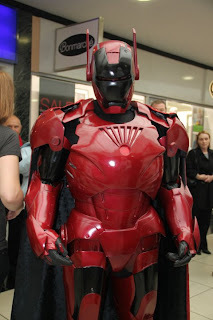 Plus I go to a lot of UK conventions to get autographs from actors etc and even have my very own customised superhero suit for the store - 'The Red Sun'! How much more of a geek could I be? 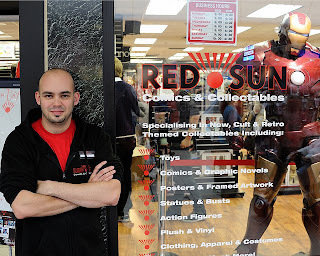 Me as my alter ego and store mascot "The Red Sun"! Most common dream = Flying/being a superhero. Most common nightmare = Aliens (fear of tall Greys like in the film 'Signs') and nuclear holocaust (white flash of light killing everyone) for some unknown reason! Name your top 3 of all time of the following and why? 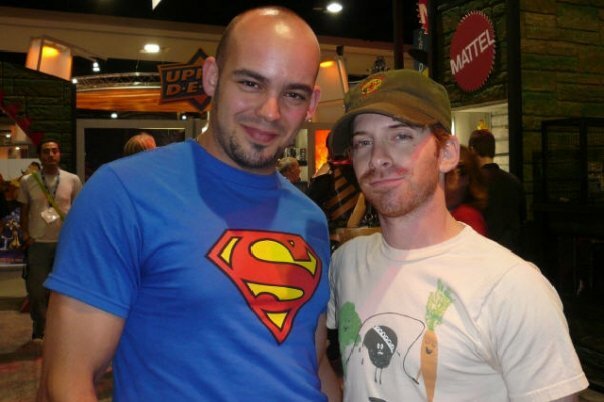 Superheroes - Superman, Batman, The Thing. Movies - Don't have a top 3 really as I love about 500 movies all the same, but films like Goonies, Independence Day, Star Wars original trilogy all Arnie films etc would have to be up there at the top. Kids cartoons - Again difficult for me as I love so many but I guess as a kid it would have been He-Man, Thundercats and Turtles. Now it's probably Justice League! I've met a hell of a lot of famous people over the years, mostly through UK conventions or the San Diego Comic Con. 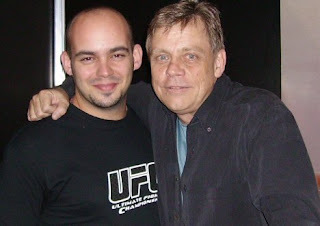 I guess someone like William Shatner or Mark Hamill are big ones for me, maybe even walking past Robert Downey Jr in 2007 at the SDCC was cool, although technically I didn't "meet" him. The two best are rather minor people but it's got to be Gigi Edgley (Chiana in Farscape) and Nathan Fillion (Mal Reynolds from Firefly) who were both frickin excellent people to meet and talk to! My biggest autograph has to be a personal one from Sean Connery from back in the 80's. Oooh that's difficult but maybe proper high quality articulated Zelda action figures from all the games. Big Zelda fan and have never picked up a good collectable, only a statue.